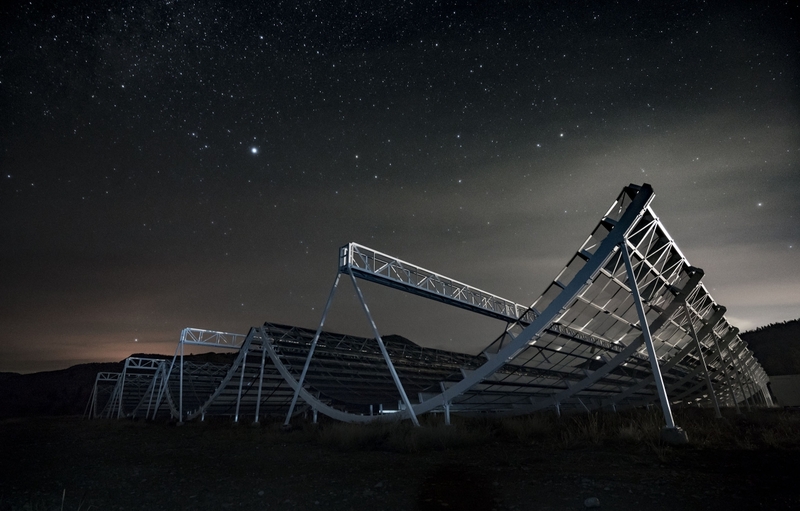 A Canadian effort to build one of the most innovative radio telescopes in the world will open the universe to a new dimension of scientific study. The Honourable Kirsty Duncan, Minister of Science, today installed the final piece of this new radio telescope, which will act as a time machine allowing scientists to create a three-dimensional map of the universe extending deep into space and time. The Canadian Hydrogen Intensity Mapping Experiment, known as CHIME, is an extraordinarily powerful new telescope. The unique “half-pipe” telescope design and advanced computing power will help scientists better understand the three frontiers of modern astronomy: the history of the universe, the nature of distant stars and the detection of gravitational waves. By measuring the composition of dark energy, scientists will better understand the shape, structure and fate of the universe. In addition, CHIME will be a key instrument to study gravitational waves, the ripples in space-time that were only recently discovered, confirming the final piece of Einstein’s theory of general relativity. CHIME is a collaboration among 50 Canadian scientists from the University of British Columbia, the University of Toronto, McGill University, and the National Research Council of Canada (NRC). The $16-million investment for CHIME was provided by the Canada Foundation for Innovation and the governments of British Columbia, Ontario, and Quebec, with additional funding from the Natural Sciences and Engineering Research Council and the Canadian Institute for Advanced Research. The telescope is located in the mountains of British Columbia’s Okanagan Valley at the NRC’s Dominion Radio Astrophysical Observatory near Penticton. The CHIME telescope incorporates four 100-metre long U-shaped cylinders of metal mesh that resemble snowboard half-pipes. Its overall footprint is the size of five NHL hockey rinks. CHIME collects radio waves with wavelengths between 37 and 75 centimetres, similar to the wavelength used by cell phones. Most of the signals collected by CHIME come from our Milky Way galaxy, but a tiny fraction of these signals started on their way when the universe was between 6 and 11 billion years old. The radio signal from the universe is very weak and extreme sensitivity is needed to detect it. The amount of energy collected by CHIME in one year is equivalent to the amount of energy gained by a paper clip falling off a desk to the floor. The data rate passing through CHIME is comparable to all the data in the world’s mobile networks. There is so much data that it cannot all be saved to disk. It must first be processed and compressed by a factor of 100,000. Seven quadrillion computer operations occur every second on CHIME. This rate is equivalent to every person on Earth performing one million multiplication problems every second.